The NASA Ames-led Icebreaker team has finished its Antarctic testing, and team members have begun departing for warmer climes. Two more team members leftthis morning, with just myself and Jackie Goordial (from McGill) remaining on the continent from ourIcebreaker drilling team. Our lab space inspection is at 4pm thisafternoon, and then bag-drag (moving luggage to Fleet Ops for checkingand weighing) likely tonight and hopefully a flight tomorrow (Friday)to “Cheech” (i.e. CHCH or Christchurch, NZ). Looking back at last week’s field testing, here’s a “day in the field” as we wrap up this deployment. Peopleget themselves up out of their warm sleeping bags around 7 am, makethemselves breakfast (no cook, it is self-serve) start work at 9am, lunch iswhenever you break for it around 12-2pm, then more work (drill tests, digging, running instruments, surveys) until after 7pm, andusually someone then finishes early and gets dinner going. The day before, we bringdinner materials into the kitchen tent, so that 24 hours later it will be thawedenough to cook. I personally drink huge quantities of reconstituted orangejuice (a gallon, one day), as we had a big surplus, the air is very dry, and McMurdo won’ttake returns of frozen foods. 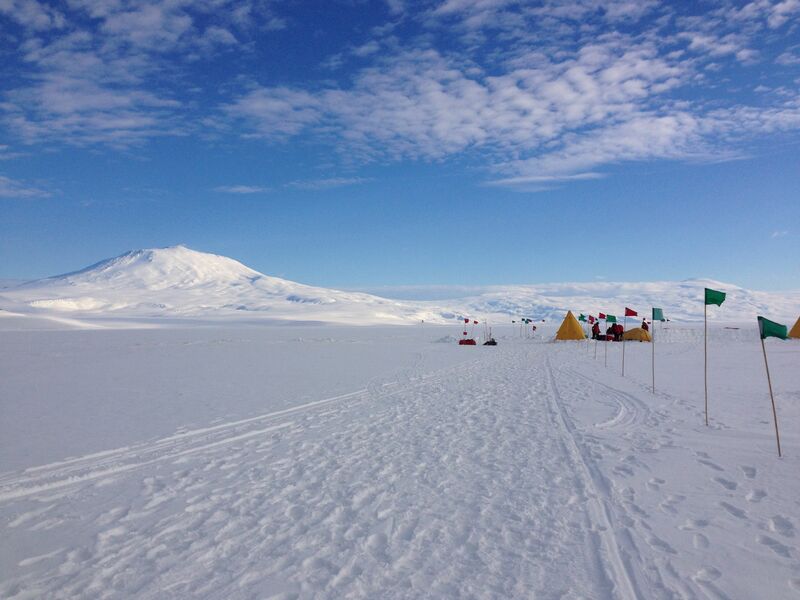 2013 Icebreaker project base camp in University Valley, Antarctica. We have a 2-burner campingstove… most things are made with hot water. We have a skillet,also, for (powdered) eggs et al in the morning and stir-fry or saute inthe evenings. Diet is heavily carnivorous and high-calorie. We havetwo main tents, which have little propane heaters, and people tend tocongregate in one or the other when not working outside. 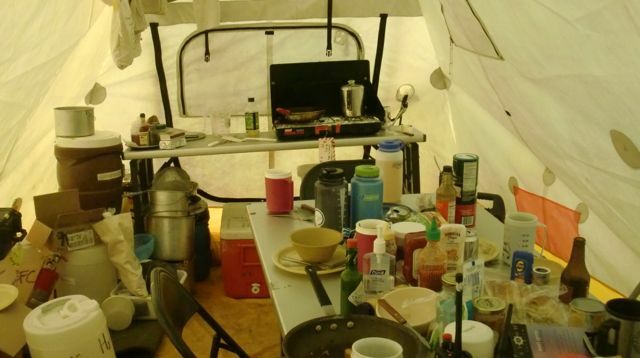 One is the”science tent”, where we have the drill control consoles, the other is the kitchen/dining tent,which has a center table used for food prep and meals. One small crowded kitchen/dining tent served as a place to cook, for seven people to take meals, and to warm up. There isno water for washing, we wipe our own plates with paper towels.Likewise with pots and pans. For encrusted food residue we apply handsanitizer to it and scrub. Water is only allowed to be used for drinking, and we ran out towards the endand had to melt snow for our drinking water. By the way, melting snow on a stovetop works muchbetter if one starts with a small amount of liquid water. Sunscreen application is anafter-breakfast ritual, we remind each other. Given that we are/were under theozone hole and the snow reflects UV as well. My hands are grimy,despite wet wipes and hand sanitizer. By evening, after dinner typically a couple of peoplechat in the kitchen, a couple watch a DVD movie on a laptop, and one or two work on the day’sdata on their laptops. Saturday night we all hung out together in thekitchen tent and polished off the rest of the liquid refreshments and told stories of past field campaigns. Hydration is important… we nag each other. Likewisethe buddy system *and* carrying a radio, even if only going a fewhundred meters away from camp… the footing is loose, very rocky, icyand snow-covered… treacherous and slow going, hiking a kilometertakes an hour (!). 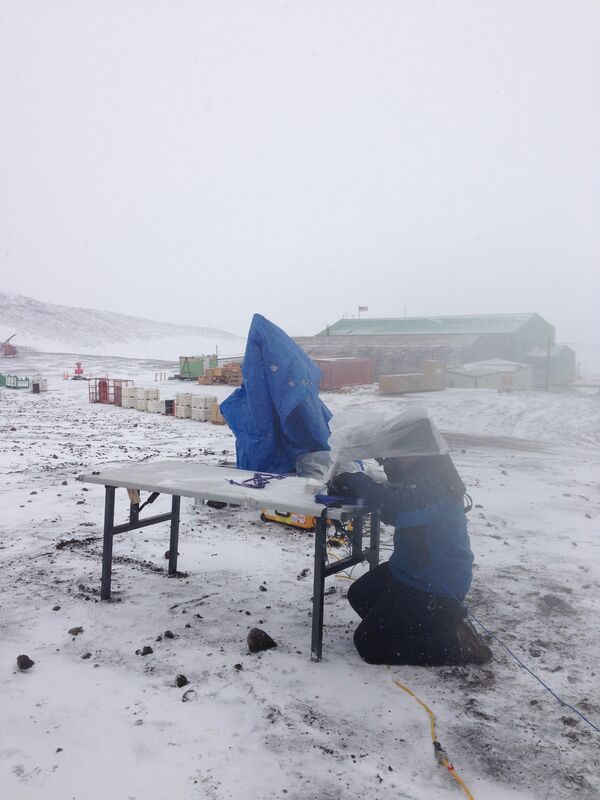 A week ago on 31 January, our team broke camp and pulled back to McMurdo. Here’s one of the pullout helicopters (Bell 212), landing next to a line of outbound cargo. And I personally never tire of waking up in the middle of this awe-inspiring, icy, huge wilderness. The NASA Ames-led Icebreaker project field team has returned to McMurdo Station, after deploying to University Valley, one of the Dry Valleys of Antarctica, from 22-31 January. Team members studied the sparse life in the soil and rocks as an analog for the niches that we might search someday on Mars for signs of past or extant life there. Others drilled cores into the permafrost to study the past climate history here. And we tested an integrated subsurface sample acquisition and transfer system that could feed future instruments or a cache to be returned to Earth for analysis. 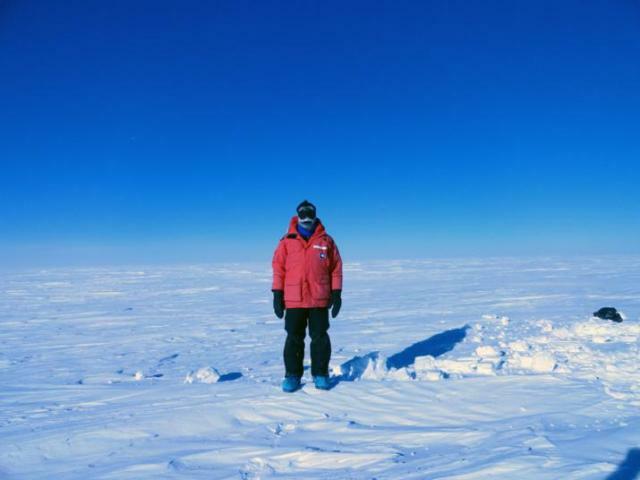 The Icebreaker drill was set up in University Valley first, on 23 January, and checked out. Added to it was a mockup Phoenix-like spacecraft deck, with mockup instruments with inlet ports and a robotic sample transfer arm. Remote commanding from Ames was possible through command encoding, compression, transmission (via Iridium satellite phone data link), reconstruction, and buffering (until read later and executed by the automated system). With time lags and store-and-forward aspects, it resembled the process of relaying commands via the Deep Space Network. The communications and the transfer robotics were set up and tested on 24-25 January. On 25 January my co-PI in the umbrella Icebreaker project, Dr. Chris McKay, sent a command file from his laptop at Ames. It was received here in University Valley about twenty minutes later, stored for three hours, then executed when the sample acquisition system came online. Icebreaker drilled 20 cm, then the arm transferred powdery cuttings to the instrument inlet ports, and a command acknowledgement log was stored and later sent back some hours later to McKay. This demonstrated remote automated subsurface sample acquisition, just as would be performed from a rover or lander on Mars. mockups with sample inlet ports (left). 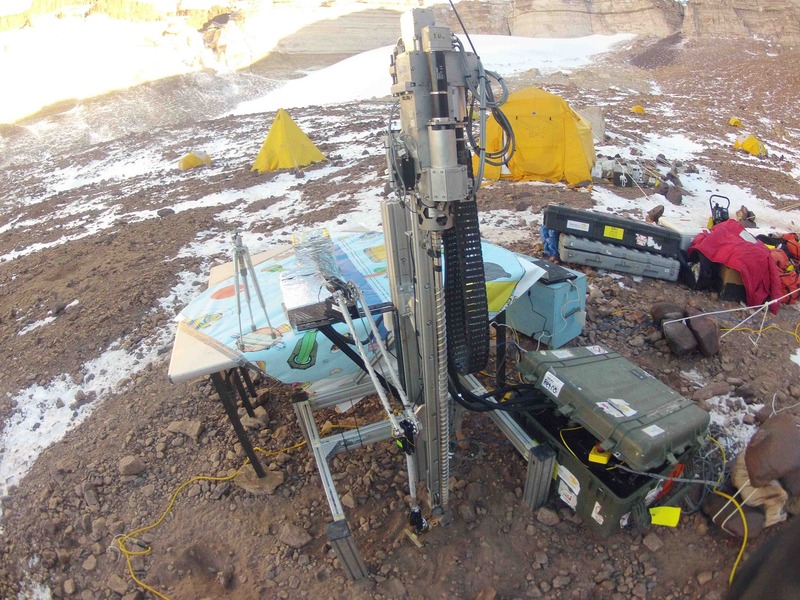 Another goal of Dry Valleys testing was to exercise the control and automation software of the drill — detecting when it is getting itself in trouble, and adjusting its settings and actions to stay safe and continue to progress. All five major fault modes came up naturally in testing (given the harsh environment) and were detected and addressed. Including jammed bits, hard materials (or bit wearout), choking in its own cuttings, side-binding (usually due to a collapsed hole), and corkscrewing (like a stopper remover, the auger hangs and everything stretches). Drill automation tests in University Valley were held near base camp as well as farther out in the valley in a previously-unsurveyed bowl-shaped depression. testing at the University Valley Mars-analog site. 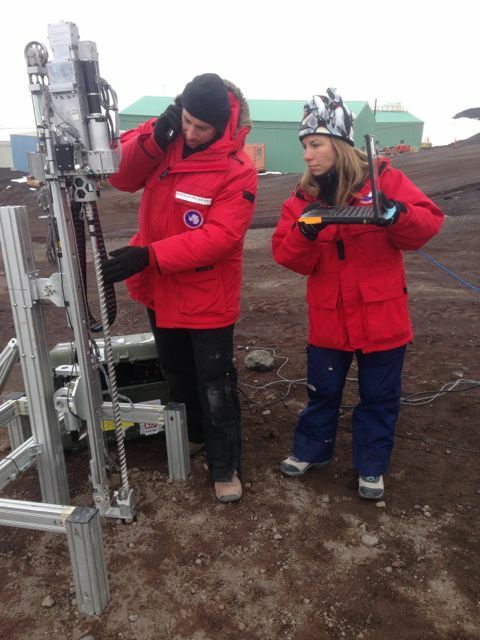 Other team members finished their studies of climate change, and drilled (with larger commercial drills) to get clues regarding the subsurface populations of microbes at varying levels, as well as studying whether ice has been formed in the soil directly from atmospheric vapor exchange, vs. precipitation. 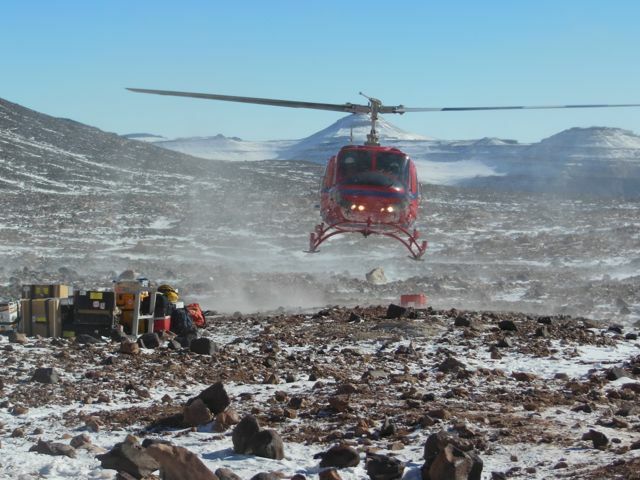 Our team completed all of our goals and objectives for this field season, and took down camp and returned by helicopter to McMurdo on 31 January. Apart from cleaning and turning in field equipment here, we had two more educational outreach sessions today (2 February) with classrooms near Montreal and Pleasanton, CA. 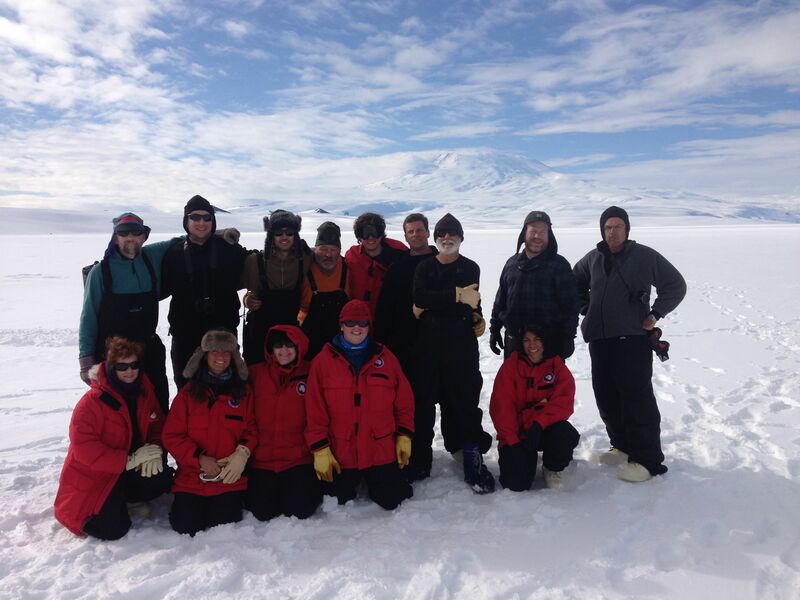 One more E/PO session will be held early Tuesday before the team closes up in McMurdo. 2013 University Valley field camp. One of the most frustratingly valuable aspects of testingand working in extreme environments is that nature is unpredictable, out ofhuman control, and hence likely to create unexpected problems and opportunities. 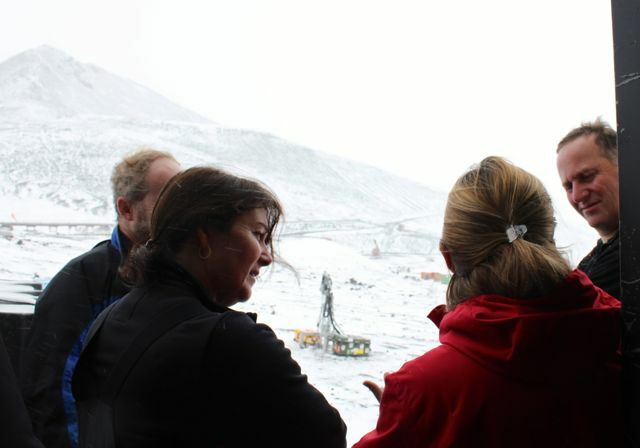 Today, that led to postponed tests buta chance to brief the Prime Minister of New Zealand, John Key, who with hiswife Bronagh Key had themselves planned to go today to the South Pole. However, this morning featured 25F/-4C temperatures, 20ktwinds with powdery snow (we now have about 8 in on the ground) and lowvisibility, so both air travel and our tests outside camp were scratched. Thisled the PM and his entourage to visit the science (Crary) lab facility thismorning. Team members (Glass, Marinova) brief the Rt. Hon. John Key and his wife Bronagh during their tour of Crary Lab today. We struggled to get our morning E/PO done, given the weatherconditions and an unexpected software problem. We recovered in time for a Santa Rosa, CA charter school andits students (mostly homeschooled) to operate the Icebreaker drillremotely. An article is in theSanta Rosa Press-Democrat (http://www.pressdemocrat.com/article/20130118/ARTICLES/130119457/1350?Title=Hands-on-look-at-a-mission-to-Mars). Since we had gotten the drill running for the students, it was easy toremove the tarps and do a show-and-tell 90 minutes later for the Rt. Hon. Mr.Key. It helped that we were thelast stop on his laboratory tour, as there was some time left forquestions. In challenging working conditions, Bolek Mellerowicz configures the Icebreaker drill control software for an educational outreach session this morning, prior to removing the tarp protecting the drill. Hence weather frustrated our original plans… but also createda unique opportunity, as long as we could be flexible and adapt to changingcircumstances (in the best NASA traditions). One of NASA’s goals, in addition to furthering humanity’sreach in aeronautics and space, is to educate and foster interest in science,mathematics and engineering by the next generation. A small percentage of every funded research proposal istypically targeted at “Education and Public Outreach”, or E/PO. One of the ways that the Icebreaker team is reaching out tothe next generation is through live video sessions with school classrooms.These include audience-tailored briefs by team members, given live fromAntarctica, with classroom questions and answers. 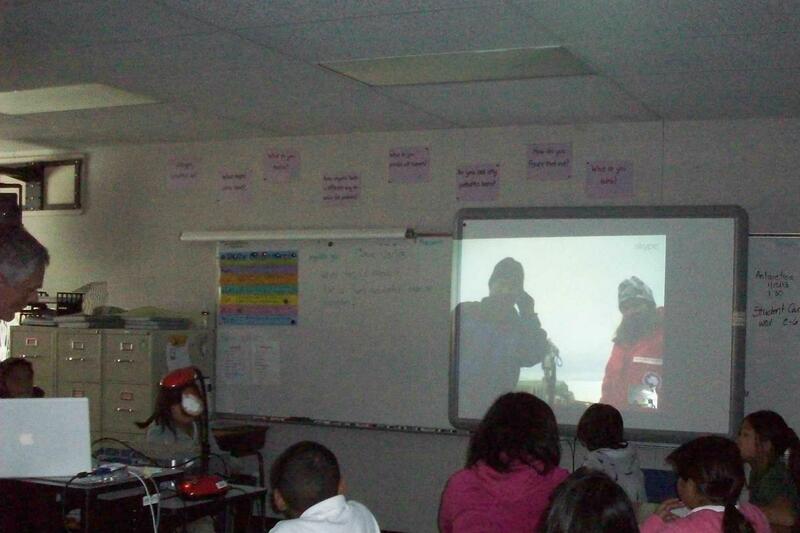 And… we let the students remotely operate the Icebreakerdrill, here in McMurdo, from their classroom. This often gets a lot of enthusiastic responses fromschoolkids. While half of the Icebreaker team is already in UniversityValley doing science, here in McMurdo we are finishing drill checkouts, minormaintenance and doing E/PO back to the US. Three days ago we did our first hour-long session with an Arizonahigh school (Verde Valley HS, near Flagstaff). We managed this despite repairing a broken wire on the drillthat had us working behind the scenes, while live, and outdoors in high 30ktwinds and blowing snow. Two daysago we did three sessions: with amiddle school in New York City; another group of mostly-Native American (Yavapai-Apache) 6thgraders at an Arizona school; and with a group of mostly Vietnamese and Hispanic kids at an elementary school in south San Jose,CA. Yesterday wedid four sessions, with the first two in Pasadena, CA: Jackson Elementary and Eliot MiddleSchool. The first session includedlocal Los Angeles media coverage (see NBC http://www.nbclosangeles.com/video/#!/on-air/as-seen-on/Pasadena-Students-Help-Operate-NASA-Drill/187231281as well as http://altadena.patch.com/articles/altadena-students-help-control-nasa-mars-drill-antarctica-jackson-elementary-school-pasadena-unified-school-district#video-12998220). Followed by a school in Pleasanton, CA and then a link to a company who hadexpressed interest (SpaceX, in Los Angeles). We have one more E/PO session scheduled this week (tomorrowat 11am PT, 8am Saturday for us) with a charter school in northern California(Santa Rosa). Then we will finishdrill and robotics testing near McMurdo this weekend before we join the rest ofour colleagues in University Valley. Two team members (Marinova and Goordial) will leave for there tomorrow,after the E/PO session. Explaining drill hammer actuation to a Pasadena middle school (Mellerowicz, Marinova). We are tentatively planning a few E/PO sessions afterreturning in early February from University Valley, most likely on 4 February(PT). Contact chris.mckay@nasa.gov if you’reinterested, as he’s handling the schedule coordination back at NASA Ames. Not everyone who arrives in Antarctica has had cold-weathercamp experience, or training in risk assessment and safety when workingoutdoors in extreme weather conditions. And the US Antarctic Program has its own procedures (and harsherconditions) for outdoor safety. Soanyone doing field work is required to take “Snowcraft I” training,colloquially called “Happy Camper,” before being cleared for fielddeployments. While the Icebreaker team all reached McMurdo Station byJanuary 7, our instruments and equipment were still in Christchurch, due to thesame flight backlog that delayed our deployment south. So we hurried to take the January 8-9class while waiting for our project gear to arrive (it showed up onSaturday). We started with two hours of classroom instruction… risk assessment, clothing choices,weather hazards, and recognizing hypothermia and frostbite symptoms. 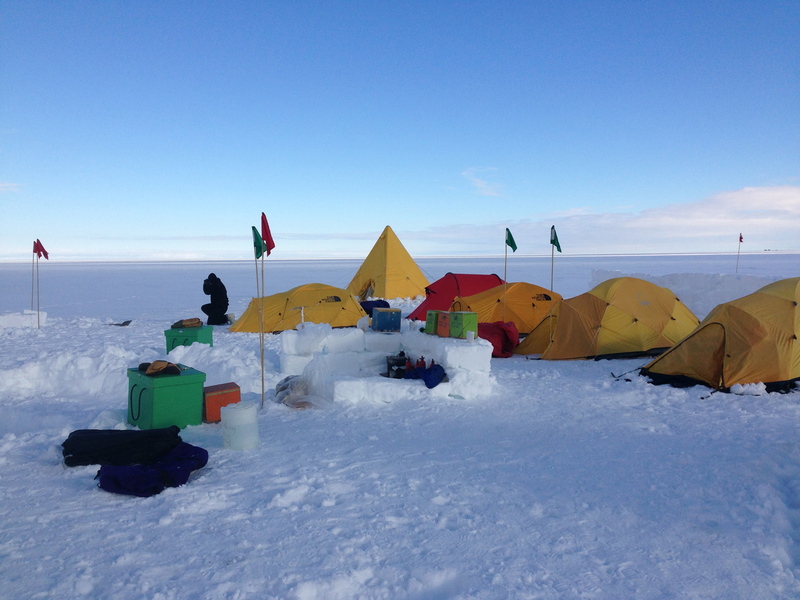 Then we packed our sleep kits, food, tents,and stoves and headed out on to the Ross Ice Shelf. Wearing our parkas, sunglasses (to avoid snow blindness) andsnow boots. We had lunch at the“I-Hut” and hands-on instruction in camp stove lighting and maintenance. Then grabbed our bags and trudged abouta kilometer away from the I-Hut to a bare expanse of snow. View looking back at our campsite, with Mt. Erebus in the background. There we set up camp… initially shown by our instructorshow to set up Scott expedition tents and mountaineering tents, and how to makedeadfalls in the snow to anchor guy lines. And snowcraft… cutting half-meter cubes of snow usingsaws, sledges to pull these to make a meter-high wind wall protecting ourtents. We dug out a kitchen/diningarea, complete with snow benches (foam laid on top, for comfortableseating). And how to dig grave-likesnow trenches, 1.5m deep and wide enough for a person’s sleeping bag. Then… the instructors departed to theI-Hut, and our group of 14 was on its own overnight. It was great! Mt. Erebus in the distance, snow sawing, warm cocoa… half of our group slept in snowstructures they built, including two women who built an igloo and two men whoexcavated an underground snow cavern complete with a small kitchen. 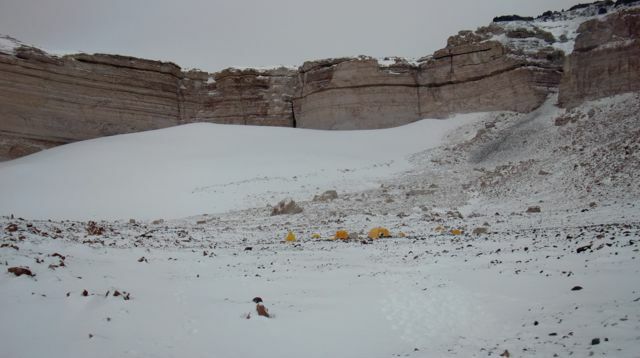 Our camp, including the snow wall (behind tents), kitchen, and dug out snow trenches (below surface). Flags mark trenches and hazards. The next morning, we took down our camp and were ready forthe 8:30am return of our instructors. We went back to the I-Hut and studied VHF and HF radio operations andprotocols, the contents of survival bags, and ran a couple of emergencyscenarios (my favorite was the white-out search and rescue scenario, when anyone going out had to be ropedand wear a white bucket over their head). 8-9 January 2013 Snowcraft I, “Happy Camper” field safety training class group. Are thereorganic compounds or signs of past or present life on Mars? The top meter isdry and irradiated. But we havestill only dug (with Phoenix in 2007) about 20cm, and the small drill on theCuriosity rover is only 5cm long. It is the Mars subsurface, of a meter or more deep, where we expect tofind any preserved life-signatures and past climate history. So, we need a drill that can retrievematerial at depths of 1m or more. Given the lightspeed time delays, a drill on Mars must be autonomous,very different from how drilling is done on Earth. The “Icebreaker”mission concept is to return to Mars to an area with subsurface ice layers inthe first 1m depth, either at the polar latitudes (first visited by the Phoenixmission in 2007-08) or mid-latitudes (Viking). The Icebreaker payload could bemounted on a modified Phoenix spacecraft bus or on a rover, and carry anautomated 1m rotary-percussive drill, the SOLID life-detection instrument, an AlphaParticle X-Ray Spectrometer (APXS) and JPL’s Wet Chemistry Lab, togethercapable of detecting organics in the presence of perchlorates or other strongoxidants. The automated Icebreakerdrill captures downhole materials in the bottom 10cm of its drill string andraises these to the surface where they are mechanically removed and transferredto on-deck instruments. 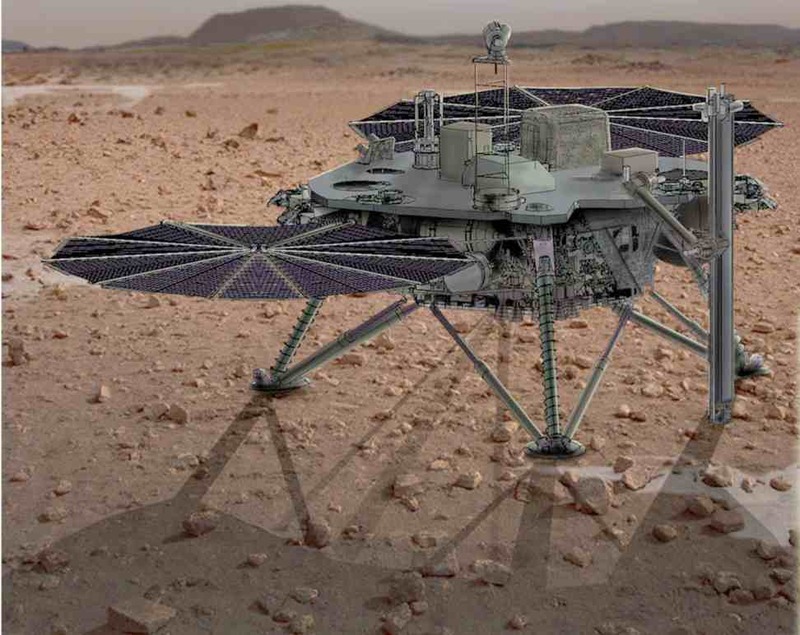 Artist’s concept of the Icebreaker drill and sample transfer system, mounted on a Phoenix-derived Mars lander platform. Planetarydrilling and sampling beyond the Moon requires intelligent and autonomoussystems. Unlike terrestrialdrills, the Icebreaker drill will work without injected drilling muds orlubricants, blind (with no prior local or regional seismic or other surveysbeyond Phoenix’s excavations), and weak (very low [200N] downward force orweight on bit, and perhaps 100W power available). Given the 7-20 minute lightspeed transmission delays toMars, while drilling faults manifest in terms of seconds, the Icebreaker drillcannot be controlled directly from Earth. Therefore highly reliable automated operations will be necessary, withthe ability to safe the drilling system and recover from almost any downholefault condition on its own. ThePhoenix arm was able to reach and scrape the ground ice but was unable topenetrate it significantly. Sampling deeper into the ground ice to acquire materials depositedduring warmer climates requires a drill. The Icebreaker drill was designed andbuilt by Honeybee Robotics. Wehave tested both rotary-drag and rotary-percussive drill designs in laboratorychamber tests and in field tests at Mars analog sites These have been in turnused to validate and test the controls and drill health management softwarenecessary for Icebreaker automated drilling and sampling operations. Over thepast four years, our Icebreaker team has developed the rotary-percussive drillhardware, the automated controls for the drill, and integrated these with asample-transfer arm to instruments on a mockup spacecraft deck. A dry run in at Haughton Crater in theCanadian Arctic in July 2012 showed that these could work together to acquireand convey subsurface samples to on-board instruments for analysis. 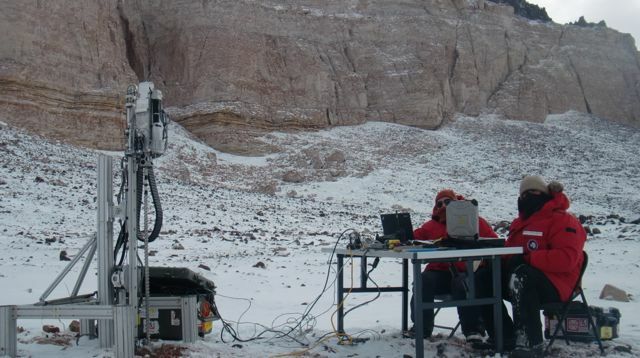 Thetechnology objective of this field season is to repeat these integrated testsin a higher-fidelity, more difficult Mars analog site, in the Dry Valleys ofAntarctica, and to continue to improve the reliability and fault-tolerance ofthe whole drilling and sample acquisition system. NASA’s AstrobiologyScience and Technology for Exploring Planets (ASTEP) program supportsinvestigations that focus on exploring Earth’s extreme environments to learnhow best to search for life on other planets. A related effort called the AstrobiologyScience and Technology Instrument Development (ASTID) program supports thedevelopment and testing of new technologies to enable the search for lifeoutside Earth’s biosphere. Icebreaker is an umbrella project supported by both ASTEP and ASTID toboth develop sample-acquisition technologies and incorporate these in investigationsin extreme environments. This fieldseason, our team of seven will be comprised of three NASA Ames researchers(Alfonso Davila, Margarita Marinova, and myself), a Honeybee Robotics drillengineer (Bolek Mellerowicz), two university co-investigators (Wayne Pollard ofMcGill University, Denis Lacelle of the University of Ottawa) and a graduatestudent (Jacqueline Goordial of McGill University). AlfonsoDavila departed for Antarctica in December and has been at McMurdo Station fora couple of weeks, serving as our advance liaison there. The rest of the team departed NorthAmerica on 29 December 2012 and are now in Christchurch,New Zealand waiting for weather and aircraft availability for the next leg downto McMurdo. 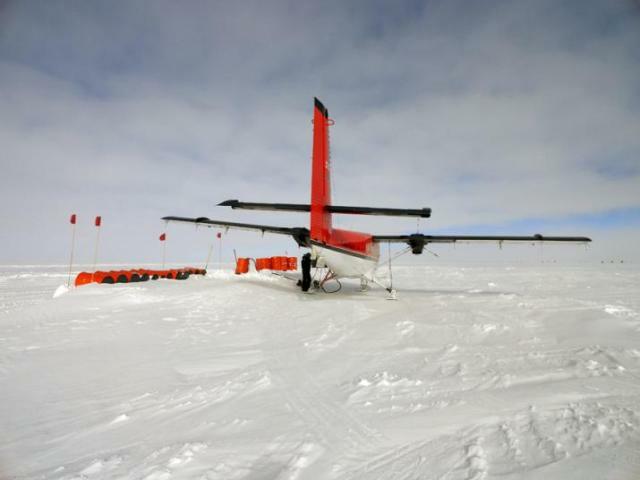 We have been told thatthe ice runway at McMurdo Station has been too warm – hence mushy – for aircraftto depart to return to the Antarctic deployment center at Christchurch, NewZealand, So we have had to wait several days longer than expected inChristchurch (which locals abbreviate as “Chch”). Arriving In Christchurch… The US Antarctic Center buildings are visible, along with a NY Air National Guard C-130. 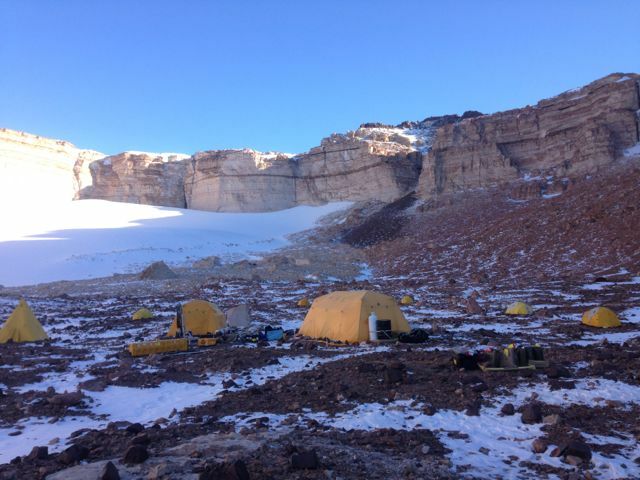 Jon Rask, who works at Ames as a contractor with Dynamac Corp, participated in a three-person expedition to deliver science hardware supplies for set up of an extremely remote field camp called PG2, at an elevation of ~11500 feet, near the South Pole. The PG2 station will be used to investigate space weather, solar activity, and the intensity of phenomenon like the Aurora Australis (southern lights). Here’s a blog post from his time in Antarctica. On January 5th, I had the opportunity to participate in a 3 person expedition to deliver science hardware supplies for set up of an extremely remote field camp called PG2, at an elevation of ~11500 feet (about 2000 feet higher than South Pole). The weather was good, only -35F on the ground and mostly clear. The flight was unforgettable, and passed over the gigantic icy polar plateau. It looked like a huge ocean, spanning to every horizon as far as one could see. We flew at about 15000 feet, which was the physiological equivalent of about 17000 feet. The air is very thin at these elevations. The Twin Otter was not pressurized, so I had to breathe heavily and fast to stay alert. Even though I was just sitting during the flight, I felt like I was experiencing a cardiovascular workout similar to running on a treadmill. 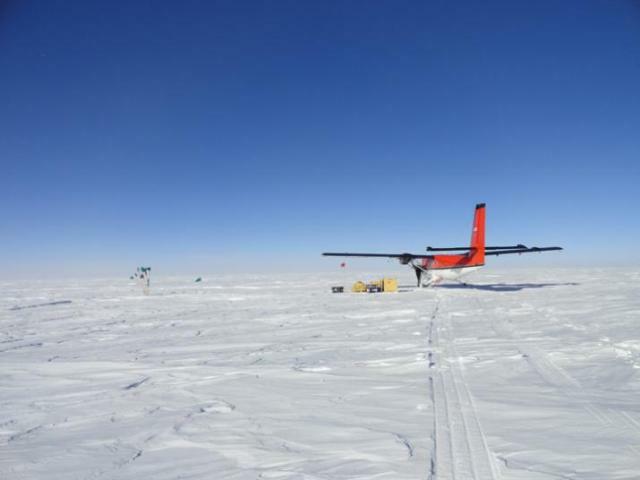 To complete our mission, we had to go to another field site in the Antarctic Gamburtsev Province (AGAP) where fuel and other supplies were cached. 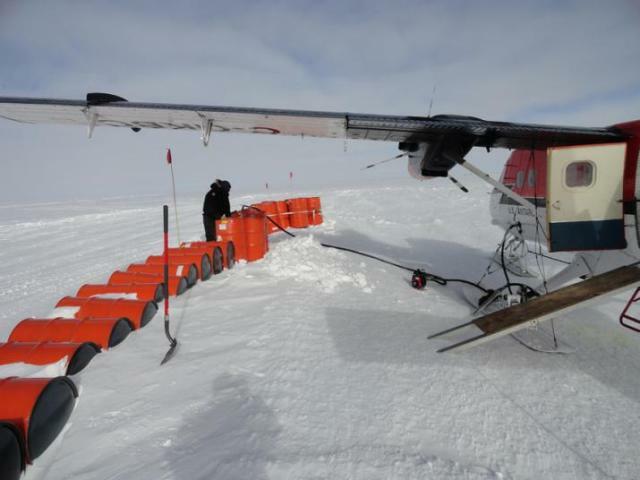 We refueled the plane and completed two fuel deliveries from AGAP to PG2 (they are the bright orange barrels, full of the extreme cold weather fuel that all the heavy equipment and planes use here in Antarctica – it is similar to diesel/kerosene). 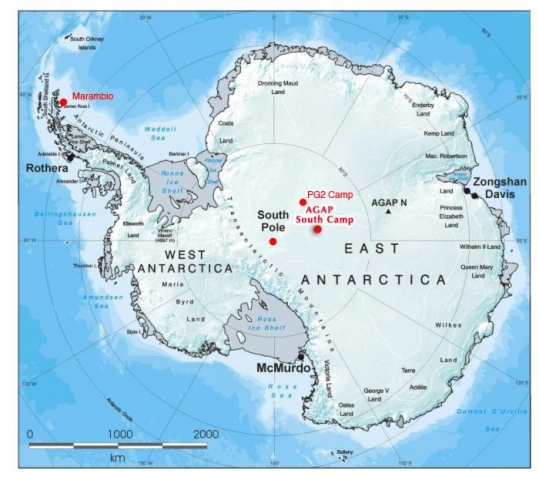 The AGAP field camp was utilized in 2007-2009 to map the subglacial Gamburtsev Mountain Range that is buried by over 2000 feet of ice and snow. This mountain range was first discovered in 1958 and believed to be very similar in size and shape as the European Alps – they are about 750 miles long and about 9000 feet high. This mountain range is extremely old. About 35 million years ago, active glaciation on their surfaces merged with one another, gradually building up to form the Eat Antarctic Ice Sheet – subsequently burying the Gamburtsev mountains in the process. PG2 will be used to investigate space weather, solar activity, and the intensity of phenomenon like the Aurora Australis (southern lights). Protons and charged particles that are blasted off the surface of the sun travel through space, pass through and get trapped in Earth’s magnetic field, then spiral down the north and south magnetic field lines. During this process they collide with Nitrogen (N) and Oxygen (O) in Earth’s atmosphere, which causes them to emit green (O) brownish-red (O) blue (N), and red (N) light. Other colors like yellow and pink are combinations of emissions from both Nitrogen and Oxygen. The data collected will be compared to similar field sites in Greenland that investigate the Aurora Borealis (northern lights), and could ultimately be used to help ensure safe navigation in future long duration spaceflight….